On the first day of the event, the two 60 Minutes executives were skeptical. By the second day, their skepticism turned to tremendous interest. By day three, they were singing the praises of this impactful experience. Experience the same transformational process they rave about with this Empowering Nightingale-Conant Audio Course. As a result of the event two 60 Minutes executives attended, then later reported on as a featured 60 Minutes segment, people from 17 different countries have participated in this truly amazing life-training program. This is as close to an “Owner’s manual” for living prosperously and happily as you may ever get! A few years back, the co-editor of 60 Minutes decided to feature a motivational training program on the show. As one of the most watched TV shows in the world, 60 Minutes is very choosy about what it features. Out of the dozens and dozens of successful motivational training programs that were available, the show's executives knew that they had to find a "one of a kind." And with virtually unlimited resources, 60 Minutes could go anywhere in the world to find the most successful training program that existed. Having earned nine Emmy Awards for his CBS News reporting, the co-editor had incredibly high standards and wanted to choose the very best! He knew that they couldn't feature just an ordinary life skills trainer and speaker. The entire program had to be genuine, powerful, and permanently impactful. The trainer had to be reputable, and, most important, that person had to get through to the attendees in a way that THEIR LIVES were permanently improved. Did they find what they were looking for? The answer is a resounding YES. Before 60 Minutes decided to send a film crew to Dallas, they decided to put this training program to a test. They sent their co-editor and another CBS News executive to Dallas to participate in this three-day training program. After participating, if the 60 Minutes executives thought that the program was truly exceptional, 60 Minutes would have a crew sent down. On day one, the two executives were very skeptical. But by day two, they started to really get into it. And by day three, they were jumping up and down and singing its praises. Which motivational program could impress 60 Minutes executives that much? And which trainer could inspire one of the most watched TV programs in the world? 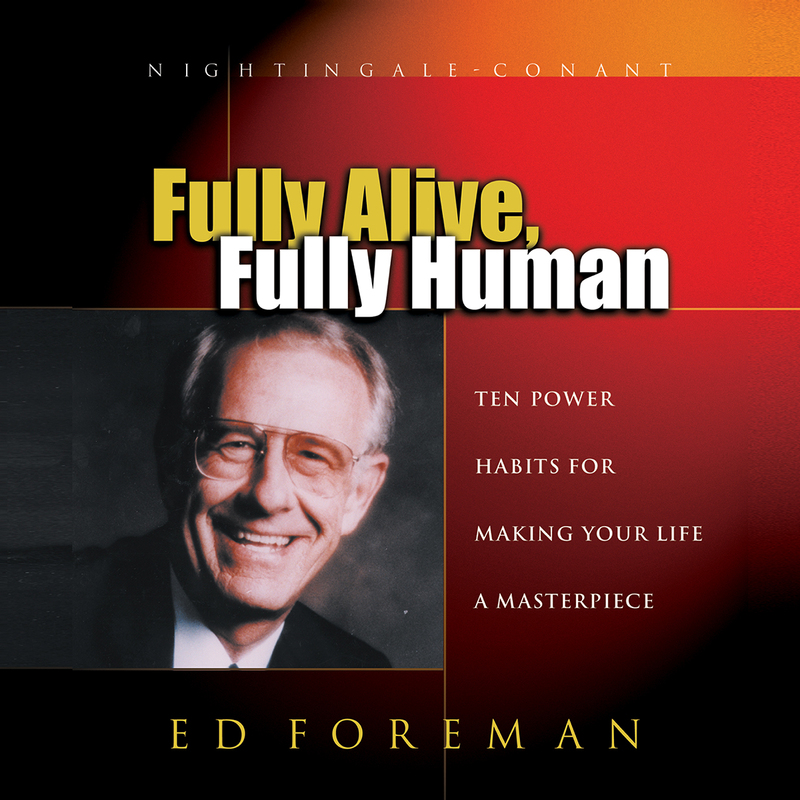 Ed Foreman's Fully Alive, Fully Human training program! As a result of that 60 Minutes segment, people from 17 different countries have participated in this truly amazing training program. In fact, there was such an enormous demand for this event that Nightingale-Conant asked Ed to create an exclusive audio series based on the most helpful highlights from the very event those executives attended. This audio course is like nothing you've heard before. We knew that Ed and his training program were absolutely one of a kind when we learned about his background. You see, Ed started out as a poor farm kid from New Mexico who became a self-made multimillionaire by the age of 26. Then he got elected to the U.S. Congress at the age of 28... and went on to become the only American in the 20th century to be elected to Congress from two different states. He even went on to become the personal adviser to five presidents and the "Mentor to Mentors"! But what's most important is that from this audio course you'll learn Ed's secrets for achieving remarkable habit-changing, life-enjoying results. Ed Foreman is truly a unique, successful, happy, healthy individual, and now he's decided to put his proven system for a lifetime of success into this exclusive Nightingale-Conant audio course. Fully Alive, Fully Human is an engaging experiential course packed with effective, proven techniques to generate success in all areas of your life and career. Ed didn't achieve this much success in his life by doing things the way everyone else does them. No, Ed spent years learning and perfecting his proven techniques. And now you can learn how he does it, yet in a fraction of the time. Ed breaks it down, as proven by 60 Minutes, into easy-to-understand and -apply steps. Yes, Ed will share with you a step-by-step habit-improvement system that will change forever your mental, physical, and emotional quality of life. Are you serious about developing a comfortable pattern of happy, healthy, successful living? Of course you are... and now you can! When you order this valuable course, you'll notice immediate results because in the very first session Ed will teach you how to develop a positive mental attitude... and make every day a TERRIFIC day... for the rest of your life. It’s true! Just ask those two 60 Minutes executives. Do you believe that you can have a terrific day every day, week after week, year after year, no matter what's going on around you? Well, you can! Believe it or not, there are energized, goal-oriented, top-tier individuals out there who are having a TERRIFIC day each and every day of the year! Join their ranks, starting by purchasing Fully Alive, Fully Human now. I'm confident that after listening to this program just once, you'll want to stand on your chair and yell at the top of your lungs: "My life really is becoming happier, healthier, and more successful!" Ed is that infectious, and his message that powerful. After Ed's got you feeling like a million bucks, next he'll show you precisely how to leap to the top of your career by implementing his three easy steps! Fully Alive, Fully Human offers three steps that help you move up to the top of your business, top of your profession. Top performers from Fortune 500 companies all over the country have learned it from Ed and are using it every day to improve their careers. I wholeheartedly encourage you to join their elite ranks by ordering this course today! You see, Ed has achieved outstanding professional accomplishments... accomplishments most people only dream of. How a memory pegboard will help you remember names, dates, places... anything, forever! An idea that made businessman Walter Haley $1 million! Ed's learned that winners are paid the big rewards for finding the solution, not the difficulty. And Ed will personally teach you how to become a winner in every aspect of your life. Who should order, listen to, and implement an audio program like Fully Alive, Fully Human?" The answer is simple... WINNERS! And Ed has winners — people at the top of their professions — all over the country — practicing these ideas. Achieve fantastic health and happiness — look better, live healthier, and feel more alive and vibrant than you have in years! If you could learn how to achieve vibrant health and a strong body without boring diet and strenuous exercise, you would want to, wouldn't you? Ed Foreman himself went from having a 40-inch waistline and weighing 238 pounds to weighing — and staying at — a healthy 168 pounds. He will share with you how he did it. How to be healthy, dynamic, vibrant, and alive! Ed has influenced today's most popular speakers! Ed Foreman has influenced personal development giants such as Zig Ziglar, Brian Tracy, and many others. "This unique personal development program is a complete formula for successful daily living. It is powerful! Many of America's top public speakers are graduates. It is one training experience I will never forget!" And hundreds of Fortune 500 companies trust Ed with their training, including American Airlines, American Express, AT&T, Bank of America, and Citibank, just to name a few! Ed says: "I guarantee you'll be happier and healthier!" And we guarantee, you'll love this audio series. People pay $1,500 for Ed's seminars — now you can have the same information for only a fraction of the cost if you order today! And learn this great information from the comfort of your home or car. It’s time you achieved your remarkable life... begin by ordering this fast-paced, supercharged audio course today! Order Fully Alive, Fully Human right now! We'll immediately send you this energy-charged program so you can start living a healthy, dynamic, and vibrant life! In this program, Ed will remind you that what we dwell upon begins to become a reality. Well, begin dwelling on the life you want by listening to this incredible audio course... order right now! I want to enjoy a greater fullness, vibrancy, enthusiasm, and vitality. Please send me Ed Foreman's audio program Fully Alive, Fully Human, at the special price below. - I can select one of two ways of ordering.